In the UK, there is a hydro power plant designed specifically to inject a spurt of electricity into the National Grid when Brits get up from their sofas en masse to make a cup of tea as the credits roll on popular television programmes. The spike in energy usage – often said to be caused by electric kettles, but actually the result of fridge doors being opened plus the power needs of sewage pumping stations as millions of toilets are flushed – is known there as 'TV Pickup'. On-demand streaming has diminished the size of the surges – the sixth largest in UK history came in 2003 during the half time break of the Rugby World Cup final between England and Australia – but what’s on the box still determines what a huge group of the population does all at once. The TV Pickup phenomenon doesn’t just affect power, but website traffic too. In Australia, businesses are provisioning for spikes in traffic coming after advertising spots and sustained activity during programmes their demographic may find dull. And many are leveraging the cloud to do so successfully. Speaking this week at an Amazon Web Services event in Sydney, Carsales.com.au chief information officer Jason Blackman revealed the site experiences a ramp-up of load on weekday evenings. “Carsales has a peak load opportunity. The traffic spikes between 7pm and 11pm. Must be something to do with My Kitchen Rules and Married at First Sight, with the other half of the relationship searching for cars while that’s on,” he said. “So we have a scaling opportunity, the elasticity of the cloud allows us to scale our infrastructure up and down through the course of the day on an hourly basis. Previously when we managed that infrastructure we had to have all that infrastructure available for peak load,” Blackman added. The ASX-listed company, Australia’s most popular automotive classifieds site, began its cloud journey in 2012. It is now “100 per cent in the cloud” and has “gone even further” by using SaaS offerings for all back office work, including its ERP. AWS gives Carsales per second billing, which has “really helped us get our costs down” during the peaks, Blackman said. It was a TV Pickup fail that prompted job outsourcing marketplace Airtasker to move its infrastructure to the cloud in 2016. Prior to the move the company appeared in a spot on Network Ten’s The Living Room which resulted in a spike in activity which crashed the website. 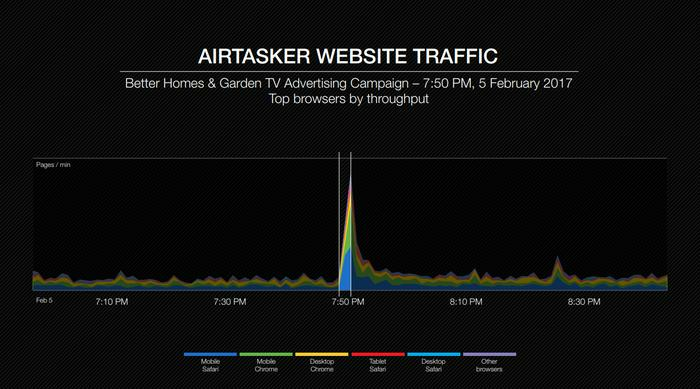 “There was this huge, Yosemite cliff-face spike of activity,” Airtasker CIO Paul Keen told CIO last year. Airtasker too now utilises AWS, with the team able to provision extra servers for next to nothing. Advertising during the AFL last year, saw load increase fourfold, and cost the company only $60. “And because we only needed it to run for an hour you then put it down to normal again. You just can't do that unless you're in the cloud,” Keen said. According to Roy Morgan research, commercial TV reaches 85 per cent of Australia — more than any other medium. On an average weekday Aussies watch a combined 39 million hours of commercial TV. However, a rising number of people (14.9 per cent) watch no commercial TV, double the number reported seven years prior. Research is ongoing to gain a better understanding on the effect of TV advertising on consumer digital activity. A study from the US last year analysed minute-by-minute TV ad insertion against online search data. It found searches for a brand peak in the first minute of a TV advert and last for around five minutes. The study, TV Ads and Search Spikes: Toward a Deeper Understanding, also found TV ads for one company will lead to spikes in searches for competitor brands. The advert content also had an effect: spikes were larger after brand focused ads than they were following price-focused ads, and bigger after less-informative ads than after more-informative ads.